The Dell 1320 is a smart choice for small-business and home users on a budget who require quality and relatively fast printing capabilities. The Dell 1320 is a multi-purpose, low-cost and a colour laser printer which has effective interfaces and attractive design. The printer can take up to 250 sheets of paper in a single tray at the bottom. There is no option for a secondary tray. A single-sheet feed slot is provided for feeding envelopes or special media. At the backside, there is a single USB socket for networking services. There are just two control buttons provided for continuing and halting a current print job. The colour quality is fine for such an inexpensive printer. But it is not a suitable for full-time photo printing as it is not able to match the colour quality of a high-end photo inkjet. With Dell 1320 toner cartridges, the text output is also sharp and well-defined. Even the smallest fonts are crisp and easy to read. Photos are of higher quality than most other lasers can manage. The print quality is good enough for a small office or workgroup requirements. The Dell 1320 is a capable small-office or personal printer, but the speed is little less than promised. It's nicely turned out, runs quietly and produces good quality print when used with Dell 1320 toner cartridges. But it is comparatively expensive to run and lacks any expandable feature. To add colour to business documents in a small office it would be good value, but it's unlikely to keep up if one’s business expands. So the Dell 1320 is a decent choice for a small office or work group, but a little more cash will provide one a faster printer with better print quality. Q. What are the dimensions of the Dell 1320 printer and how much does it weigh? A. The dimensions of the Dell 1320 printer are:- 400 mm (Width) x 422 mm (Depth) x 378 mm (Height). It weighs around 17.2 kg. Q. How many pages can the Dell 1320 printer print per minute? A. Dell 1320 can print up to 16 monochrome and 12 colour pages per minute. Q. Are your compatible Dell 1320 toner cartridges environment-friendly? A. Yes, all our compatible toner cartridges are environmental friendly. They are made from recycled cartridges that were used previously resulting in very little usage of new materials or components. This helps in conservation of the environment. Q. Is there any way I can reduce the amount of toner used while printing with the Dell 1320 printer? A. To save toner, you can enable Toner Saving Mode in the Advanced tab. This allows the users to select a print mode that uses less toner. However, when this feature is used, the image quality will be lower than when it is not used. Q. I am thinking of purchasing a multipack of Dell 1320 toner cartridges. Are there any additional charges for ordering cartridges from this site? Q. Can I print directly from a memory card without using a PC on my Dell 1320 printer? A. Unfortunately, you cannot directly print from a memory card with this printer as it does not provide memory card support. Q. How can I check the toner level of the Dell 1320 toner cartridges in my printer? A. You can check the printer status menu to check the status of your cartridges. This menu displays the percentage of toner remaining in each toner cartridge. A message appears when a cartridge is empty. Q. Can I use this printer for small-business purpose? Will this printer fit my budget? A. Yes, if you are looking for some multi-purpose printer with less handling options, then the Dell 1320 is the best choice for you. With its low-cost and space-saving feature, this printer can be used in areas where space is an issue. But due to its low cost, the printer is limited to paper-handling capability and is also slow in printing then promised. 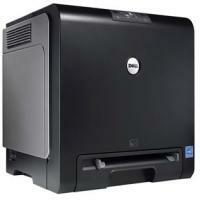 Thus, the Dell 1320 proves to be a decent choice for a small office or workgroup, where printing work is limited. Q. Is the printer user-friendly and can I install it without any help? A. The setup for this printer is relatively complex than the other models. But the installing instructions are written in an easy way so that one can install the printer without any outside help. You can also check the instructions available online on Dell website. Q. Can I print quality pictures with the Dell 1320 toner cartridges? A. You can print pictures through this printer but it is not suitable for full-time photo printing as the printer is unable to match the colour quality of a high-end photo inkjet. Q. Will I get a refund guarantee in case I am not satisfied with the Dell 1320 toner cartridges? A. The company assures a money-back guarantee if the customers are not satisfied with the product. Q. Do I need to change my Dell 1320 toner cartridges if I am getting a poor print quality? A. A poor print quality does not necessarily mean the cartridges getting depleted. One should perform a head cleaning procedure to rule out the blocked head issue. The instruction manual of the printer has a detailed guideline for performing the head cleaning. Q. Can the Dell 1320 printer scan too? A. Yes, the printer supports the scanning feature.